This is a typical financial series that can be used to visualize the state of a market for a period of time. The series operates with a special kind of data in the form of four parameters defining the stock market - open, high, low, and close. The high and low values show the price range (the highest and lowest prices) over one unit of time. The open and close values indicate the opening and closing price of the stock for the corresponding period. Candlestick series have body, which has a different color depending on the value of open and close prices of the financial data point. This kind of series require one CategoricalAxis and one LinearAxis. OpenBinding: A property of type DataPointBinding that gets or sets the property path that determines the open value of the ohlc data point. CloseBinding: A property of type DataPointBinding that gets or sets the property path that determines the close value of the ohlc data point. LowBinding: A property of type DataPointBinding that gets or sets the property path that determines the low value of the ohlc data point. HighBinding: A property of type DataPointBinding that gets or sets the property path that determines the high value of the ohlc data point. You can use the CategoryBinding, OpenBinding, CloseBinding, LowBinding, HighBinding properties of the CandlesticSeries to bind the DataPoints’ properties to the properties from your view models. 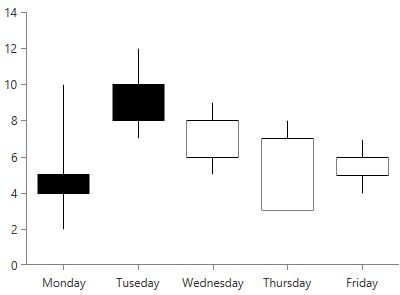 You can see how to style the candlestick series using different properties, in the CandlesticSeries section of the Customizing CartesianChart Series help article. Additionally, you can use the Palette property of the chart to change the colors of the CandlesticSeries on a global scale. You can find more information about this feature in the Palettes section in our help documentation.